Poole's Cavern or Poole's Hole as it is sometimes known, is a 2 million year old, natural limestone cave on the edge of Buxton in the Peak District National Park. 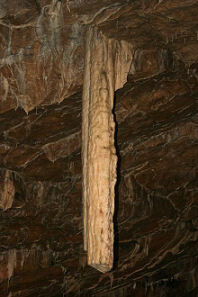 It is reputed to have acquired its name from a fifteenth century outlaw, Poole, who is said to have used the cave as a lair and a base to rob travellers in the fifteenth century. Archeological explorations which took place in 1981 and 1983 have suggested that the cave was occupied from the Bronze Age. Some of the finds have been interpreted as suggesting that one of the chambers was used for religious purposes by Romano-Britons; an alternative explanation is that the cave was a metal-workers' workshop. The land surrounding the cavern formed part of the vast Chatsworth estates and the cavern was opened as a show cave in 1853 by the 6th Duke of Devonshire, however, the cave was already a tourist attraction, the ill fated Mary, Queen of Scots, is claimed to have been an early visitor. Poole's Cavern was listed as one of the Wonders of the Peak by the writer Charles Cotton in 1683, bringing a new-found fame to the cave. Entry into the cavern had always been difficult. Glacial sediment at the entrance passage combined with a low rocky roof to necessitate an uncomfortable 10 metre crawl into the cave's first chamber. Frank Redfern enlarged the cavern entrance in 1853 by removing tones of sediment and blasting away the low roof space. Discoveries were first made when the cavern was opened as a showcave in 1853. The glacial sediment was dug out of the cavern entrance and human and animal bones were unearthed. These finds were acquired by the famous barrow digger Thomas Bateman. Whilst these remains provided little information to archaeologists, much more spectacular finds were made by Frank Redfern, custodian and guide who, in 1865 began to excavate beneath a layer of stalagmite within the cave. He unearthed animal and human remains in the stalagmite layer itself plus some Roman coins, samian ware pottery and a bronze brooch inlaid with silver. All these finds were installed in a museum at the cavern entrance. Among the finds made in the cavern in the late nineteenth century were some crude decorated fragments of pottery which were recognised as being of pre-Roman date and further fragments have been found. The region currently open to the public is around 310 metres in length, and includes chambers named the Roman Chamber, Great Dome, Poached Egg Chamber and Sculpture Chamber. Features of interest include large stalactites/stalagmites called the 'Flitch of Bacon' and 'Mary Queen of Scots' Pillar', as well as stalagmites with a porous texture and 'poached egg' colour, which has been attributed to minerals leached from lime-burning on Grin Low above. Part of the cavern is accessible to wheelchairs. The cave system is believed to extend further, but has not been explored. In 1998 a video camera lowered down a borehole revealed the existence of a further chamber, named "Seventh Heaven". At the summit of Grin Hill, 437 metres (1,434ft) above sea level, a short walk from the cavern, stands the folly known as Solomon's Temple from where there are spectacular views across the High Peak. The tower itself was built in 1896 to replace an earlier structure. The folly occupies a site of ancient significance. It rises from the centre of an ancient burial mound, and during the tower's construction an archaeological dig here revealled several Bronze Age skeletons from the 'Beaker' period, along with later Roman items.